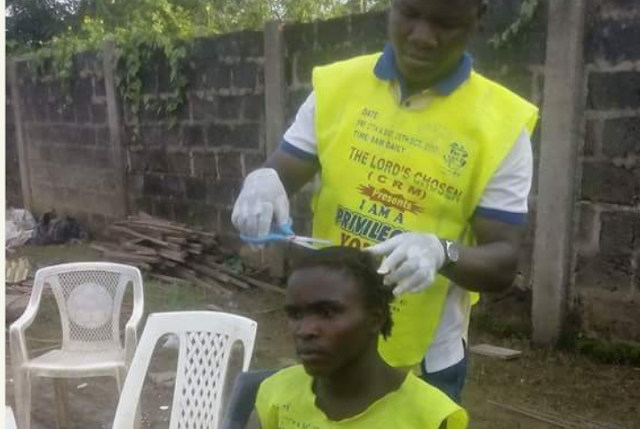 MAD BOY HEALED AS YOUTH OF TLCCRM, EBONYI STATE TOOK OVER THE CITY OF ABAKALIKI IN PUBLICITY. According to a report shared by a social media user,history was made today at Rice Mill Area of Abakaliki in Ebonyi State as the gallant youths of The Lords Chosen Ebonyi State Headquarters rallied round the city in acrobatic publicity ahead of their State's Youth Programme coming up on Friday and Saturday this week. They sighted a young man who was mentally deranged on the course of their publicity at Rice Mill where "The Prestigious Abakaliki Rice' is produced. They surrounded him and sang in the Holy Ghost coupled with prayers. As these activities were going on, the spirit of madness left the young chap, his senses were restored.He was able to respond to few questions he's was asked afterwards.